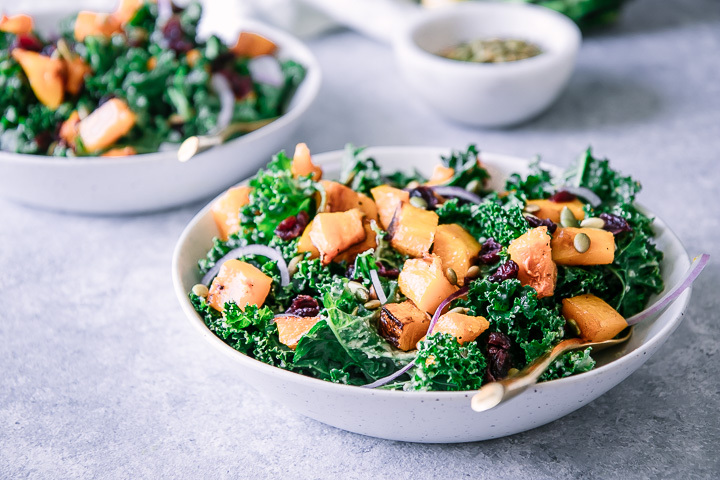 Butternut Squash Cranberry Kale Salad, a hearty fall-inspired vegan salad with warm roasted squash and pumpkin seeds with a homemade avocado pear dressing. The perfect healthy autumn salad! Oh, butternut squash, how I love and loathe thee. 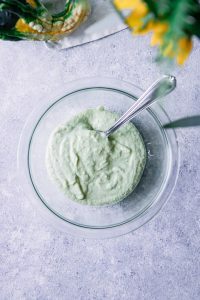 You make wonderful soups, roast to a delicious mix between sweet and savory, are packed with vitamin A, and add really great color to food photos. As much as I love the abundance of spring and summer produce, the fall harvest has my heart. From pumpkins to pears to squash to chestnuts, I love everything about this season. Some may find simple salads boring, but mix together seasonal autumn ingredients and flavors and my mouth starts to water. That’s where this simple Butternut Squash Cranberry Kale Salad comes in. With roasted butternut squash, dried cranberries, and pumpkin seeds (pepitas! ), this is the perfect salad for cozy autumn nights. Let’s make it! This autumn butternut squash salad takes only minutes to toss together, but before building the salad you must first prepare the roasted squash. Start by cutting the ends off of the squash and then using a paring knife or vegetable peeler and removing the outer skin. 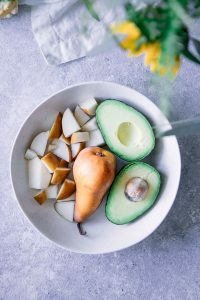 Then slice lengthwise, remove the seeds, and cut into 1/2 inch (1.25 centimeter) cubes and toss with olive oil, salt, and pepper before roasting on a baking sheet in the oven for about 30 minutes, or until golden brown. 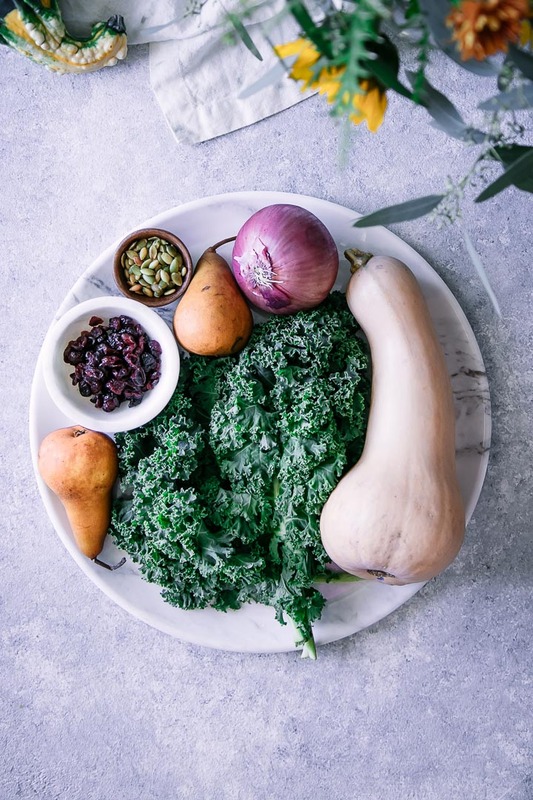 When the squash is done, toss it with kale, red onion, cranberries, and pumpkin seeds with a simple homemade vegan dressing made of one seasonal pear, one half avocado, olive oil, apple cider vinegar, maple syrup, and salt and pepper. Viola! A simple creamy, but plant-based, salad that is perfect for fall nights. …and blend in a food processor or blender with olive oil, vinegar, and salt and pepper. 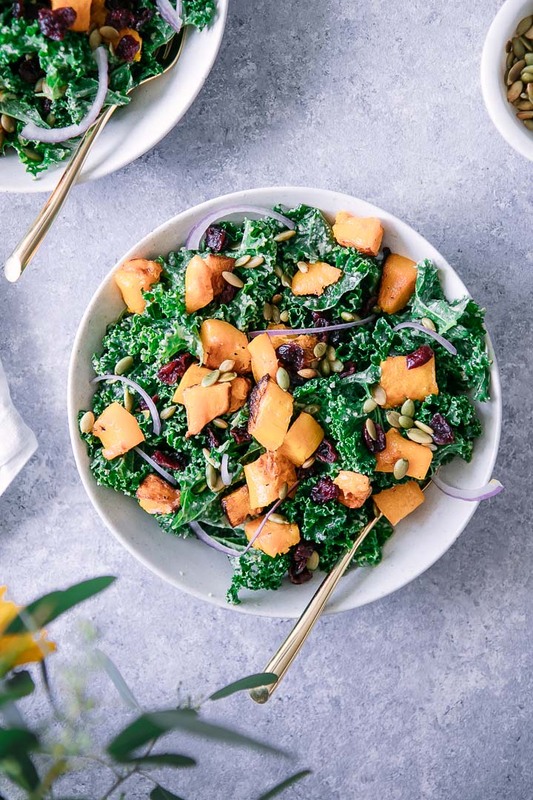 I hope you enjoy this Butternut Squash Cranberry Kale Salad recipe as much as we do! It’s a great salad to make ahead and eat all week long, as the hearty kale leaves hold up well in the refrigerator as lunches the next day. Craving more simple fall salad recipes? Check out our Mexican-Style Three Bean Salad and Warm Maple Fig and Beet Kale Salad recipes, both easy salads using the season’s freshest flavors. 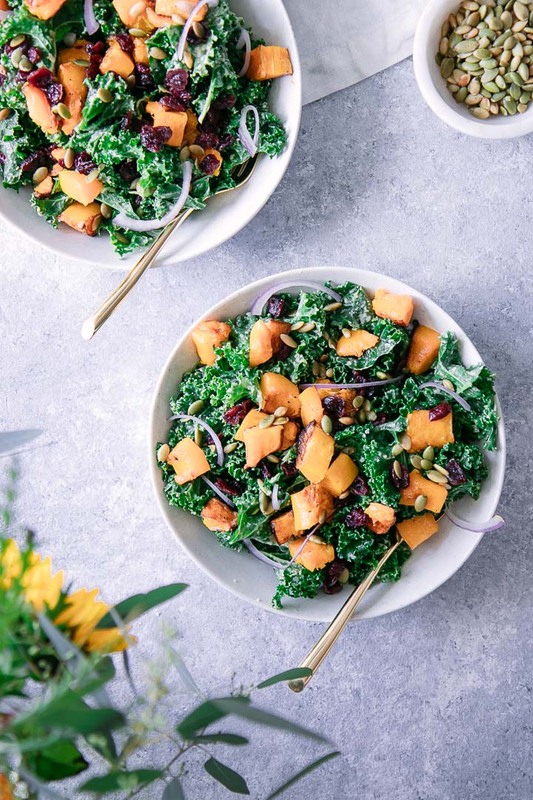 Did you make this Butternut Squash Cranberry Kale Salad recipe? Leave a comment below and rate the recipe to let us know how it turned out. Save this recipe for later by pinning to your favorite fall Pinterest board and make sure to tag me on Fork in the Road’s Instagram to show me your salad creations! Toss squash with olive oil, salt, and pepper and roast until golden brown. My trick for perfectly browned squash: Leave in oven for 15-20 minutes untouched, or until sizes are browned. Then flip every 5 minutes or so until golden brown, but not burnt. For dressing: add avocado and pear to food processor or hand mixer and chop until smooth(ish). Add vinegar, maple syrup, salt, and pepper and mix until combined. Then slowly add olive oil until desired consistency and salt and pepper to desired taste. I wanted my dressing to be a bit thicker to stick to the kale leaves, but you do you. 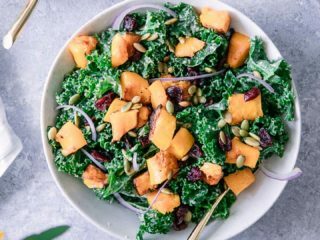 When butternut squash is done, combine it with kale, red onions, cranberries, and pumpkin seeds in a bowl and top with dressing. I used my hands to rub dressing into the kale to coat throughout. Enjoy! It holds up well refrigerated and tasted great the next day for lunch leftovers. Leftovers & Storage: This kale squash salad is a great salad for leftovers as kale is a sturdy green that holds up well to refrigeration after it is dressed. It will keep in the refrigerator for two days if dressing is added, more if dressing is on the side. Nutrition: Nutrition information includes dressing. This salad is high in fiber, high in plant-based protein, and is an excellent source of vitamin A and C.
I really liked this salad, it didn’t take long to make after the butternut squash was done in the oven. I would make this with pumpkin too. I’m glad you like it! Roasting the butternut squash does take the longest but once that’s done the salad comes together quickly. And I love that it’s a great salad for making ahead and eating for leftovers because the kale is so sturdy that it holds the dressing well. Thanks so much for stopping by! This is so delicious! We loved it! Thank you for sharing! I highly recommend making this salad. I’m so happy to hear that Missy! Thanks for leaving a review, have a great day.